Investigator has definitely lived up to its name on its current epic voyage – first helping uncover the interaction between our oceans and atmosphere, and now exploring uncharted territory on the sea floor. But what’s really got some crafty scientists on board excited is a big ol’ bag of rocks. 900kg of rocks to be precise! Investigator approaches Lautoka port in Fiji. Image Doug Thost. Our current story starts in the beautiful tropical waters of Fiji. Having just completed a 65 day voyage studying the deepest parts of the region’s oceans, Investigator is set to transit back to its home port of Hobart for a period of maintenance. This follows a voyage where an extraordinary 670 vertical km of Conductivity-Temperature-Depth (CTD) casts were completed and many thousands of water samples were collected and analysed on board, some from as deep as 6000 m.
The data collected will help us understand the relationship between the oceans and atmosphere, and uncover some of the driving factors behind climate variability and change. It was the briefest of port calls in Lautoka, Fiji, with just enough time to swap out science teams before a new quest for knowledge began. While the port call completed the research voyage, and the ship was technically on a transit back Hobart, that doesn’t mean the science comes to a stop! Ever wondered what happens if you send a Styrofoam cup to the ocean depths? Image Doug Thost. Each minute of Investigator’s time is expertly crafted by a team of scheduling geniuses to squeeze every last drop of science from the time at sea. Even a transit between research voyages delivers more data, more understanding and, in this case, a trip that rocks! 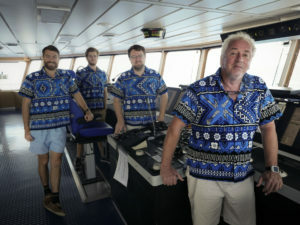 Joining the ship in Fiji were scientists from across the globe – USA, Canada, UK, France, New Caledonia, New Zealand and, of course, Australia – with a mission to study uncharted waters between Fiji and Australia. Basins, canyons and who knows what else lies on the sea floor down there – no one has looked, certainly not with the precision that Investigator provides. 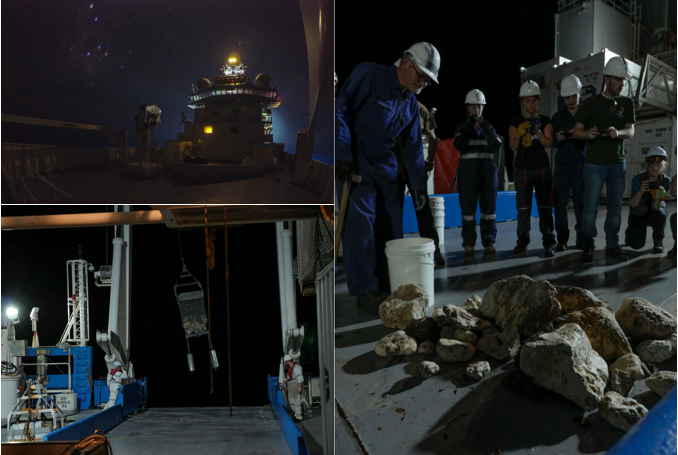 A whole range of equipment was employed to sample areas previously unsampled, including every marine geoscientist’s good friend, the mighty rock dredge. This is one time that dredging up the past is a good thing! A total of seven dredges were completed and 900 kg of a wide variety of rocks from the sea-floor were hauled on board. These were eagerly divided between the collaborating institutions on the voyage: University of Sydney, University of Tasmania, New Caledonian Geological Survey and GNS Science, New Zealand. It is expected that the rocks will keep these teams busy with work for the next 2 years. Dredging rocks around the clock! Images Doug Thost. 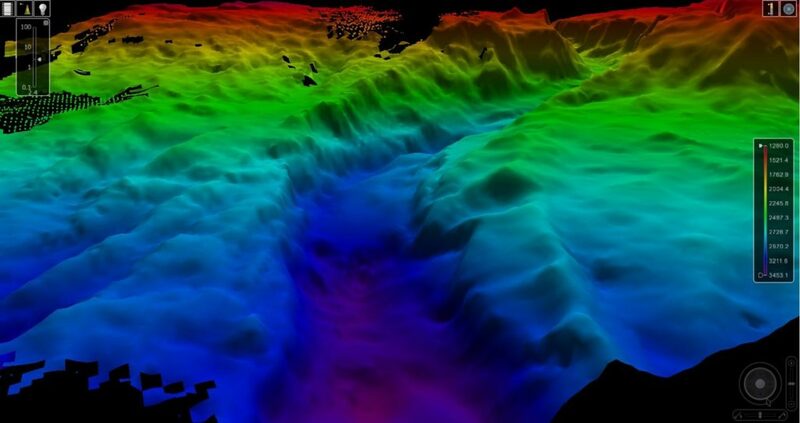 Investigator’s multibeam bathymetry mapping has revealed amazing features on the sea floor. The samples will help improving our understanding of the geology of the sea floor around Australia but provide only one piece of the puzzle. The hands-on work of the geoscientists was complemented by some high tech support from Investigator with its multibeam bathymetry mapping capabilities. This has allowed some impressive firsts to be achieved in mapping of the region and some of the discoveries have been amazing! Mapping has revealed deep canyons, wide valleys, high cliffs, and even plate boundaries, all on sea-floor over 3000 m, and as deep as 7000 m, below the surface! These are uncharted territories and the work provides important data that will allow researchers to better understand the structure and history of the sea floor off our eastern coast. Making a memento, deep ocean style! 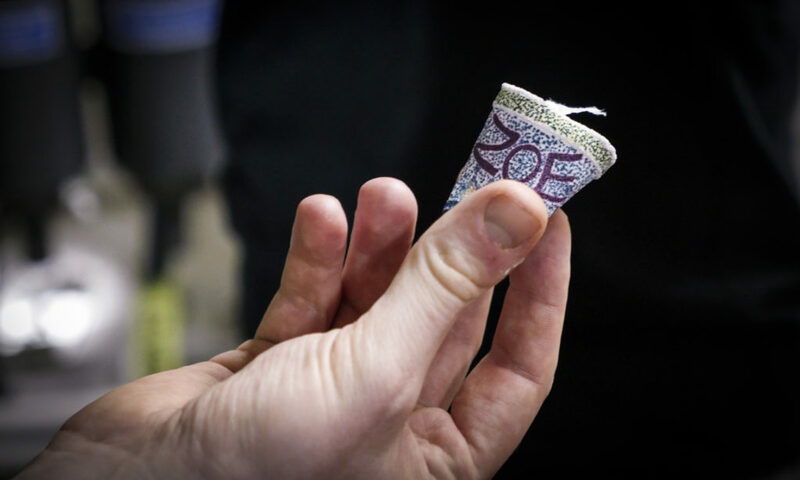 While free time is rare, it has become a tradition for those on board Investigator to find the time to create some crafty and unique mementos to remember their voyage. Enter the wonderful world of polystyrene cup artistry! Step one: gather your materials. You’ll need some marker pens, a polystyrene cup (of course! ), a dash of saltwater inspiration, an onion bag and a CTD. Decorate your cup in a design of your choosing. Sea animals are a crowd favourite! Step two: attach cups to CTD. Secure the decorated cups into the onion bag and attach the bag to the CTD (out of the way so that measurements are not interfered with). The CTD cast needs to be deep – about 1000m should do it. At that depth, the pressure is about 100 times the atmospheric pressure at sea level. Voila! A miniaturised polystyrene cup. Crafty! Image Doug Thost. So why do the cups shrink? Polystyrene has tiny air spaces in it that make it light and buoyant. The high pressure of the deep ocean squeezes together all the tiny air spaces within the polystyrene of the cup, making the whole cup shrink. It’s a bit like when you squeeze a stress toy – it becomes smaller. Except at the high pressures deep underwater, it’s like the stress toy has been squeezed by the Hulk! Sharing the magic of science isn’t just limited to those on board. A CSIRO staff member on the transit had been entrusted with the carefully decorated cups from his child’s grade 3 class. 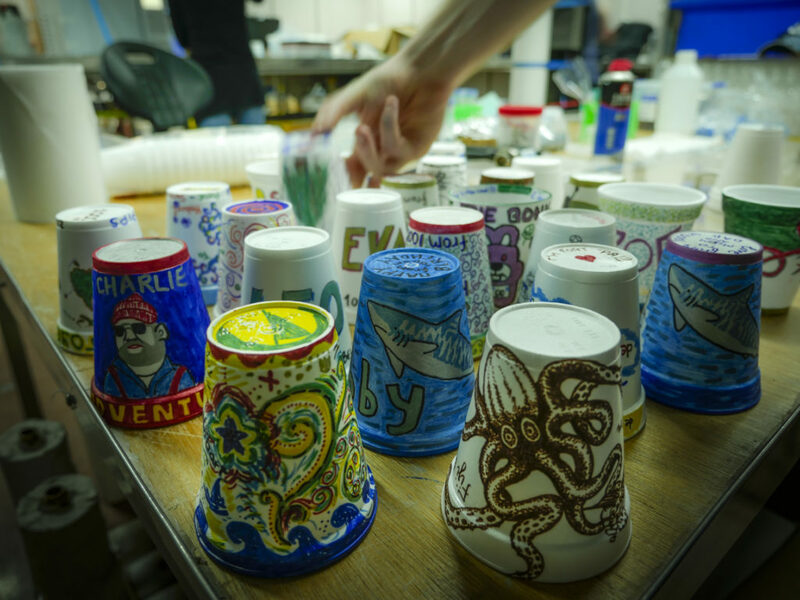 As part of the activity, they were all asked what they thought might happen to the cups when they returned from the ocean. Answers were varied and some very creative! One child (an early career environmentalist maybe?) thought the cups would break up and pollute the sea (we certainly make sure that doesn’t happen!). Another thought a starfish might make a home in it. We hope they will all be very excited when their unique, miniaturised cups are returned to them! The Captain and crew have just come back from Fiji, you say? Who’d have thunk it! Image Doug Thost. After 80 days at sea, Investigator returns to its home port of Hobart, Tasmania on the morning of Thursday, 14 July 2016. A period of maintenance will then follow before the ship’s next research voyage in late August. Please help us welcome back our amazing science super ship and all the intrepid heroes on board by sharing a photo using #RVInvestigator if you see the ship on its way back down the coast or coming into port. Did a hotspot break up your relationship? I’m currently in the USA on a Department of Education Tasmania Hardie Fellowship to look at ways to improve education programs at my marine discovery centre, expand the use of digital technology and learn more about the Ocean Literacy framework. At a presentation at the recent National Marine Educators Conference the chief scientist of NOAA did a live on-stage teleconference with the crew from the Okeanos Explorer http://teacheratsea.noaa.gov/. NOAA also has a program called teacher at sea http://teacheratsea.noaa.gov/. Yesterday I sat in a lecture theatre with a bunch of teachers and we had a teleconference with a teacher aboard the EV Nautlis http://www.nautiluslive.org/ev-nautilus. Teleconferences like this to schools are possible because of the communications facility based at Rhode Island. If Australia is going to invest in such a wonderful vessel like Investigator is it possible that we can also develop a deeper connection between it and our Australian youth along the lines that NOAA and Corps of Exploration have developed? I mean, the blog is great and all, but teleconferencing is the future (actually it’s the here and now!). Hi Andrew, thanks for your comment. The future is indeed now! We are very lucky to have awesome people in our IT and Education and Outreach teams here at CSIRO, and we already provide remote ship-to-shore live link-ups for school groups. It’s an area we are really looking to expand further and we have some exciting programs in the pipeline for this coming year, including an educator on board program and the collaborative CAPSTAN initiative. Investigator can also support live TV broadcasts, and we were very pleased to have a live cross earlier this year from the remote voyage to Heard and MacDonald Islands. Stay tuned for further details but, in the meantime, if you want more information about what our fantastic floating virtual classroom can offer, or want to share with us some of the things you have seen others doing, please feel free to get in touch via the MNF website. It is an impressive effort and they were a very busy bunch of researchers on board! During the two legs of the 65 day research voyage they completed 140 full ocean depth casts along 170W from the ice edge to the equator. The deepest casts were down to around 6000 m, which take many hours to complete. It’s no wonder some people take up knitting while they’re on board!